Thanks to FloraCraft® for sponsoring this post! 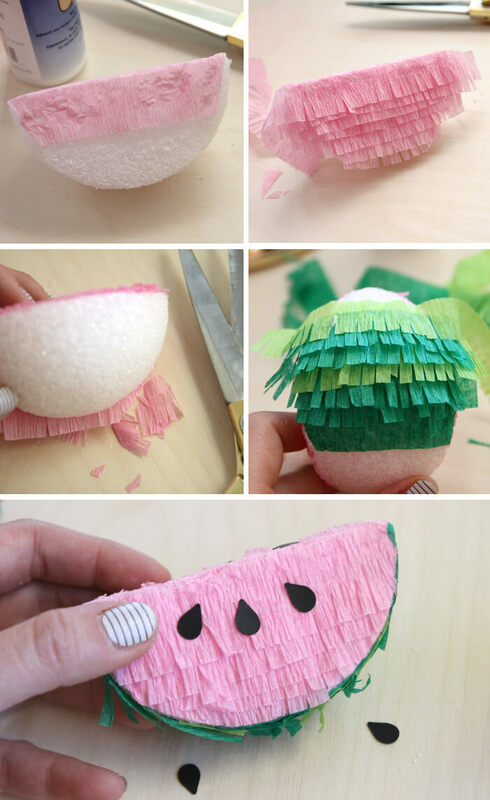 It’s warming up out here in the desert, which means it’s time for me to start getting excited about cute, fruity crafts. 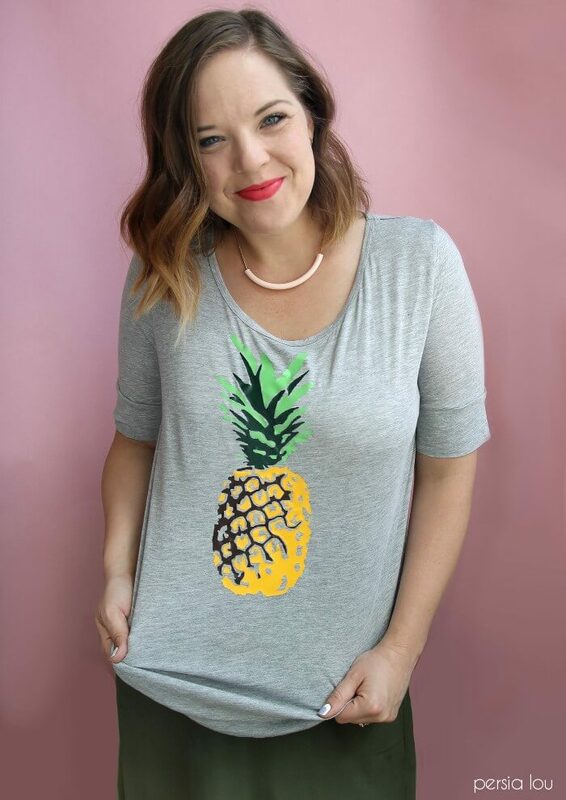 In face, I started a new pinterest board just for collecting my favorite fruit-inspired projects – there’s some good stuff on there folks! 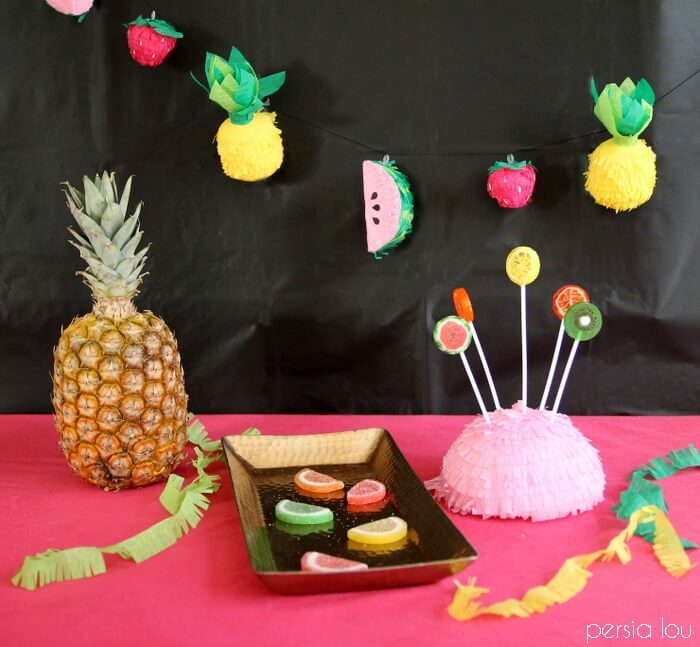 So, it’s probably no surprise that when I got this month’s FloraCraft® Make It Fun Crafts challenge – a box of foam balls in all kinds of sizes – I decided turn them into a cute fruit garland. And I’m so happy with the way it turned out! 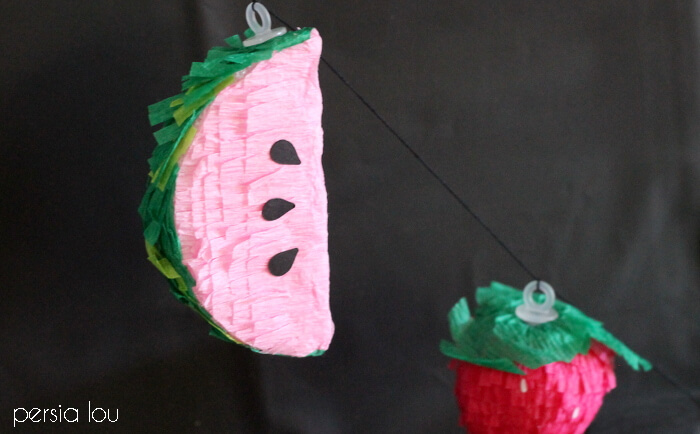 I used crepe paper fringe to color and cover my little fruits, which gave them a fun piñata look – perfect for a Cinco de Mayo celebration or really any barbecue or Summer get together. 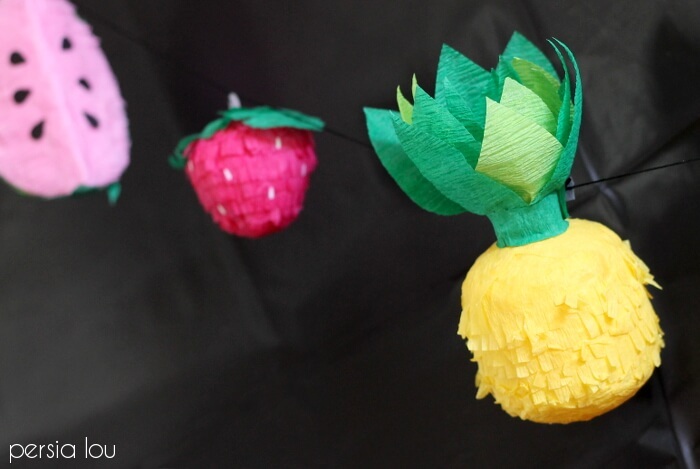 Each little fruit is covered in crepe paper fringe. 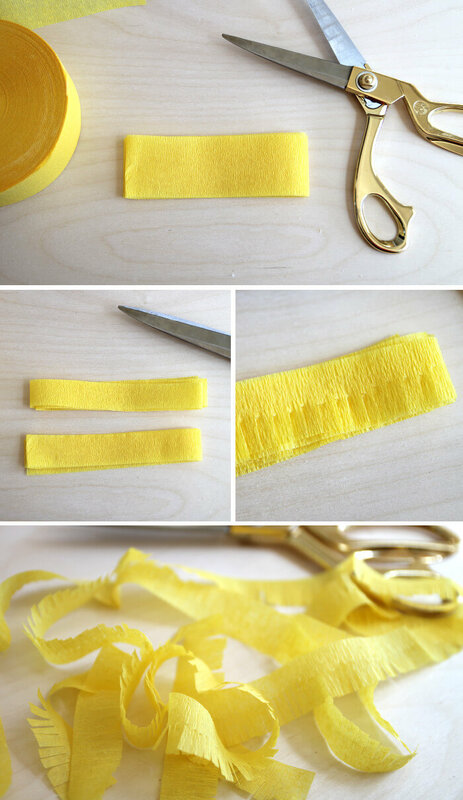 I found it was really easy to cut strips of fringe if I folded up a piece first, cut it in half lengthwise, and then snipped the fringe. 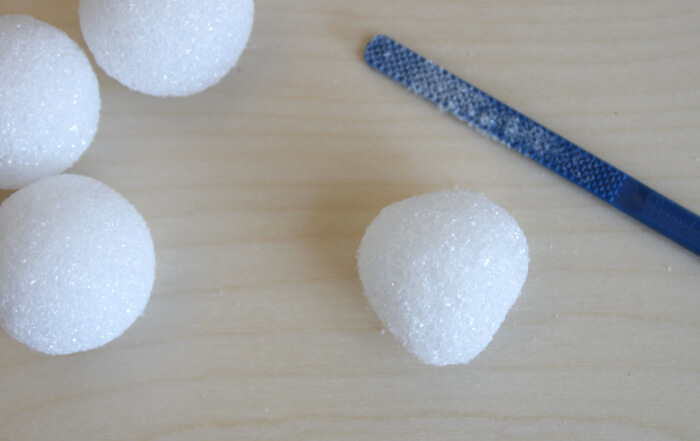 I used the same process to make the fringe for each fruit, but I shaped the foam differently for each one. 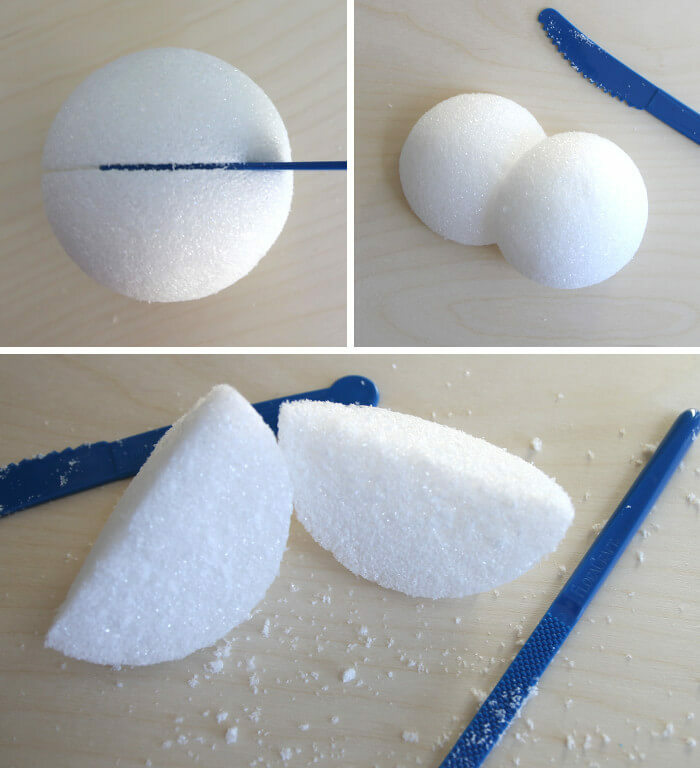 The foam tools kit includes a shaper that I used to gently file off any uneven pieces. When each wedge was all nice and smooth, I added a piece of pink crepe paper across the top of each wedge and then layered the fringe up each side. Then I flipped the wedge over and trimmed off the excess. On the back of the wedge, I used strips of dark green and light green fringe to give it a striped look. Finally, I glued on a few black seeds I had cut from cardstock. For the pineapple, I started with a 3″ ball and used the shaping tool to file down the sides to create a more cylindrical shape. 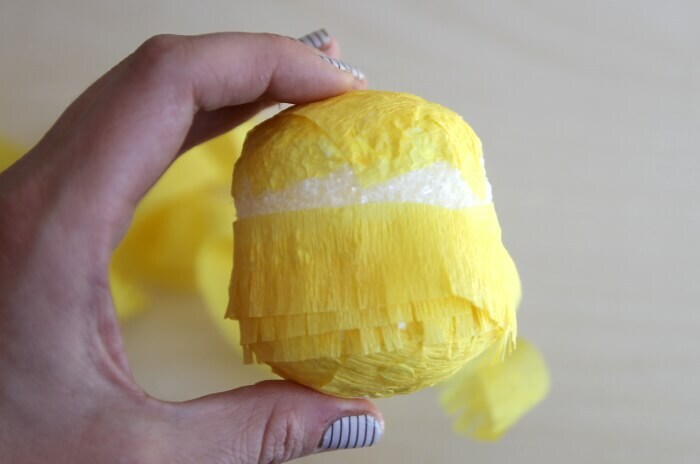 Next, I glued a few pieces of yellow crepe paper on each end of the pineapple shape to cover the ends. 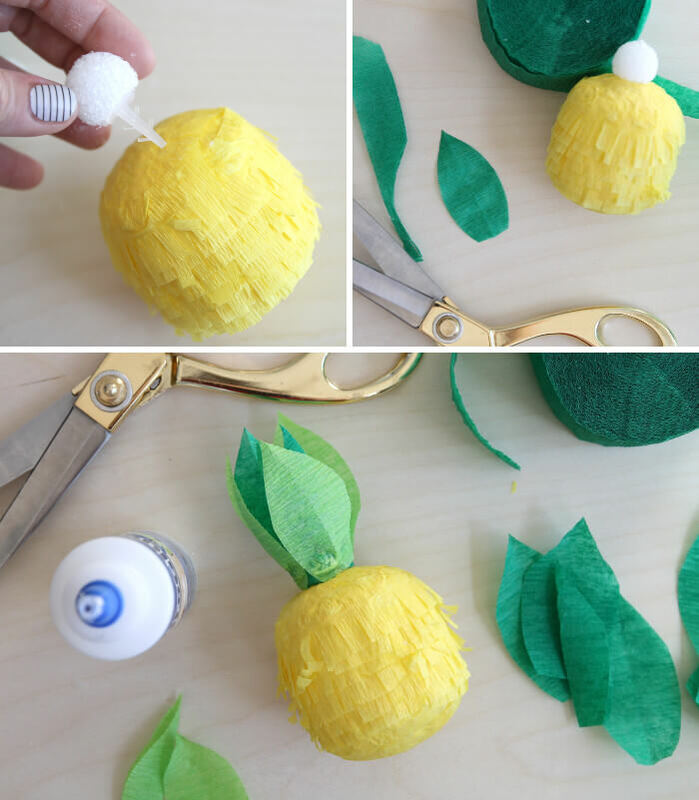 After I wrapped yellow fringe all around the pineapple shape, it was time to add the green leafy top! 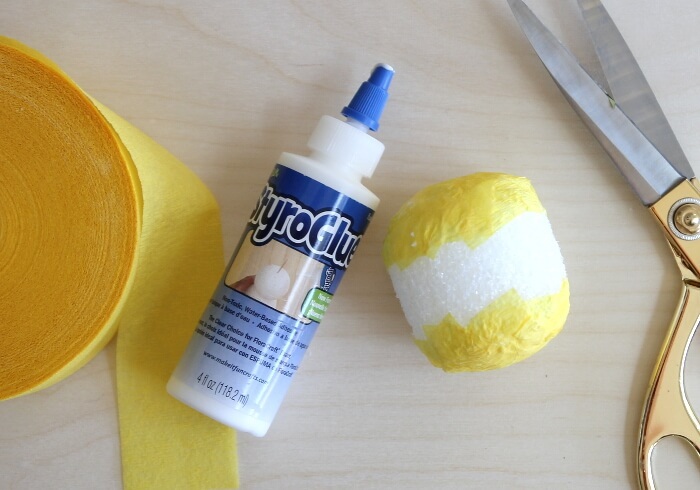 I did this by cutting the bottom off a 1″ ball and used one of the cool foam connectors to join it with the yellow pineapple shape. 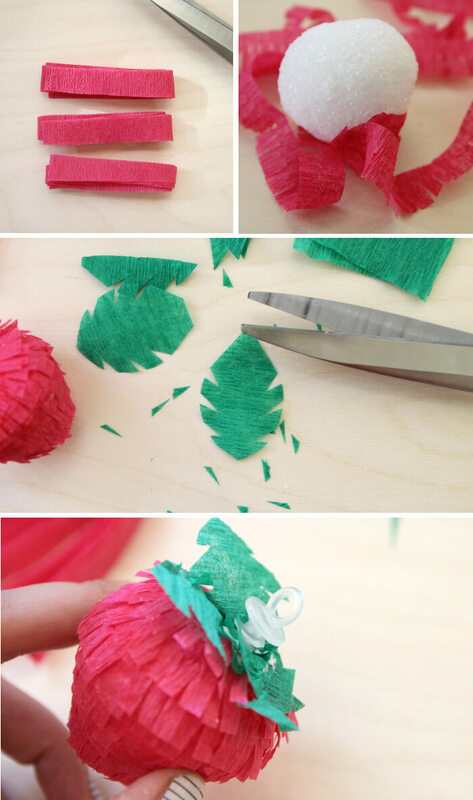 I cut leaves out of the light and dark green crepe paper and glued them around the small ball attached to the top. 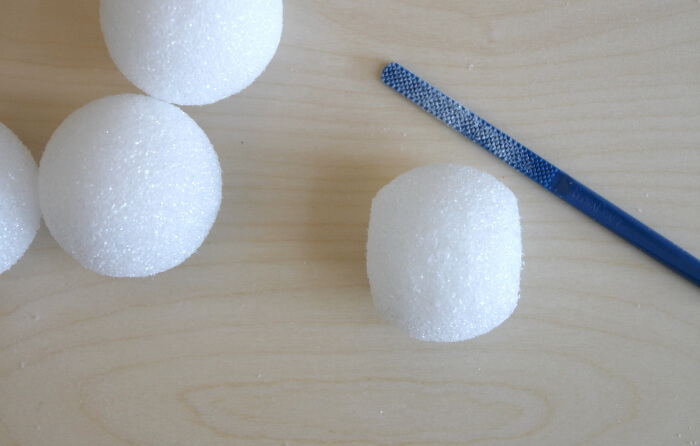 To create the cute little strawberries, I started by giving a 2″ ball a bit of a point on one side. Since the strawberries are smaller, I wanted smaller fringe, so I cut the crepe paper into thirds instead of halves. Then I got wrapping! Wrap up that sweet little berry! Again, I cut leaves from green crepe paper and glued them to the top. I screwed a little foam eyelet into the top to make a stem and a place to connect it to the garland. I also added tiny white seeds cut from cardstock (I used my Silhouette to cut the machines, which make it super easy, but you could totally do them by hand or with a punch). And that’s it! 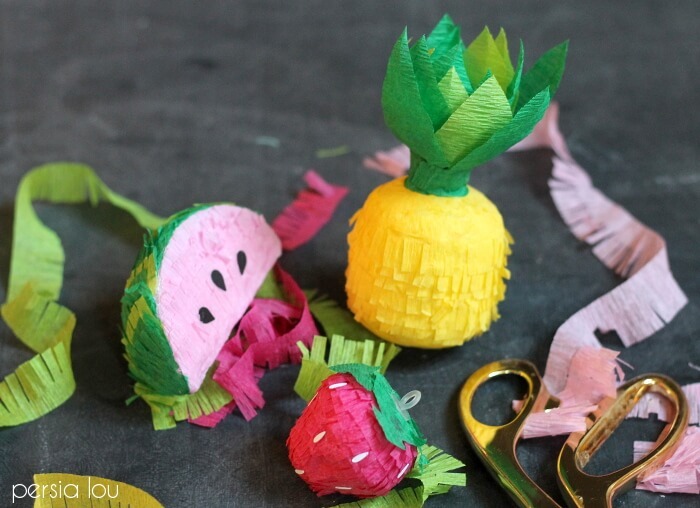 These little fruits are a lot of fun to make and pretty much the cutest things ever. 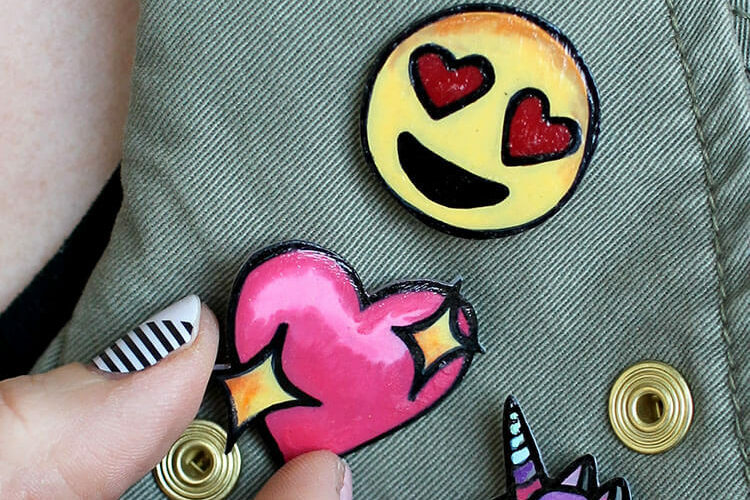 Those are SO super cute, Alexis! 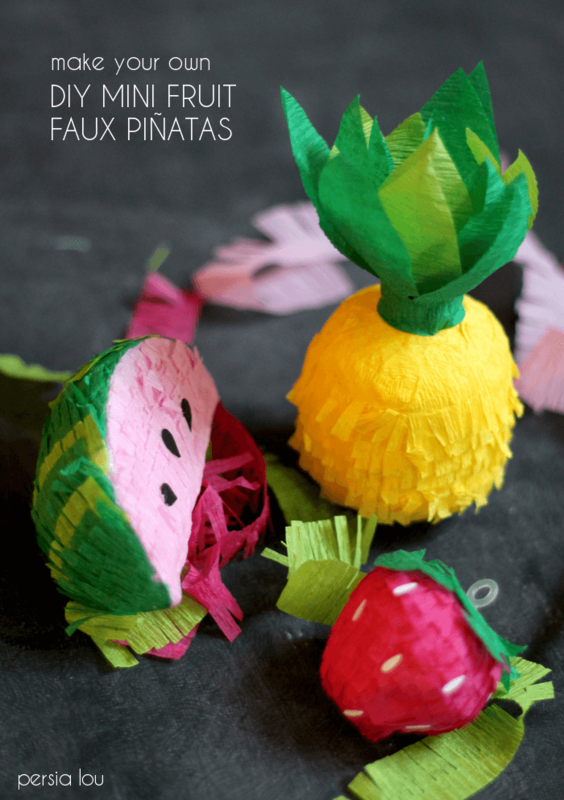 I love mini-fruit pinatas! This is just about the cutest thing I’ve ever seen! Thank you! ALEXIS. 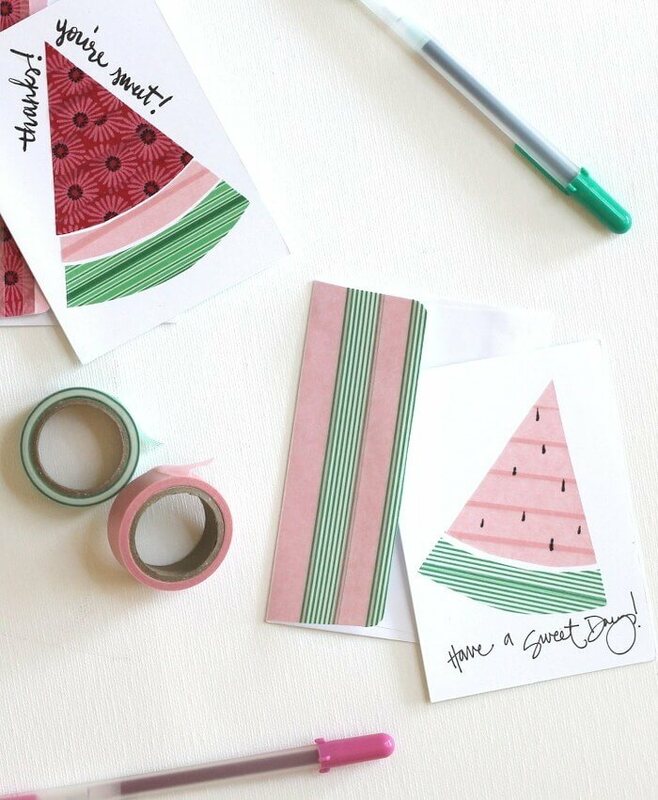 I just knew when you shared a tiny glimpse that you had a watermelon in the making but you far exceeded even my ideas with how adorable these are. 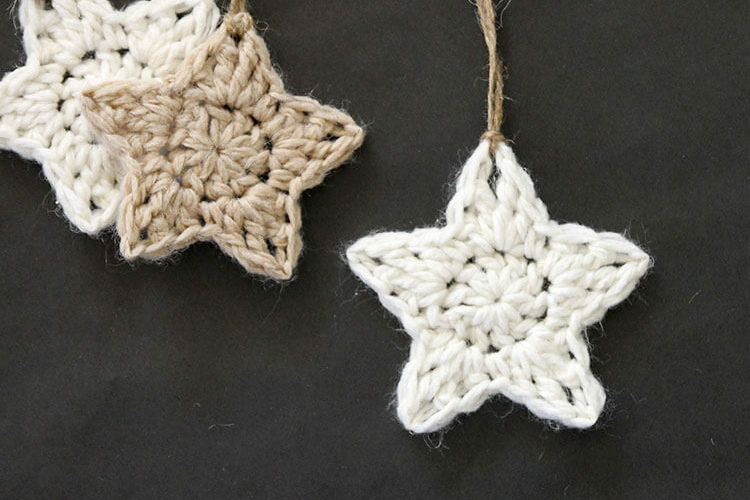 You’ve got to hang them in your craft room! Too too cute. Pinning. Ah! So so so cute! 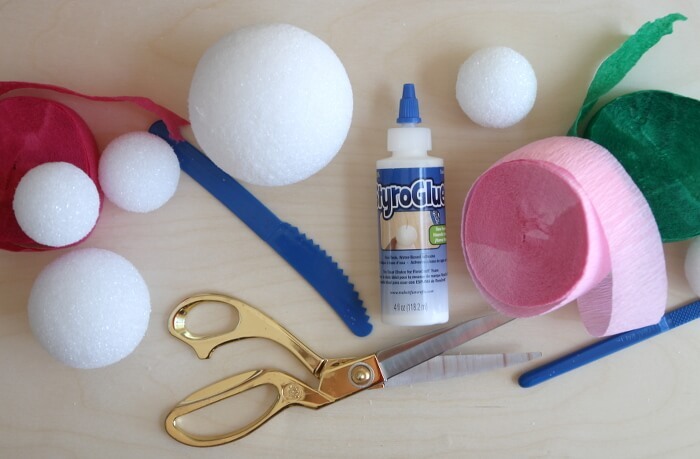 Very creative use of foam balls. I was thinking the watermelon might be my favorite but I don’t know anymore- they’re all freaking adorable. These are adorable! I can’t wait to make some. I think I have left over Styrofoam from a project. This will be perfect for an upcoming party. Thanks for the tutorial! Pinned & shared btw. This are totally adorable Alexis!! I can’t even handle it. Great job and thanks for sharing! this looks really fun! i might try it !!!!!!!! Love, love this idea! Super cute craft! I love that they are mini! Thanks so much for pinning this to the P3 Party Board! You are being featured tomorrow! 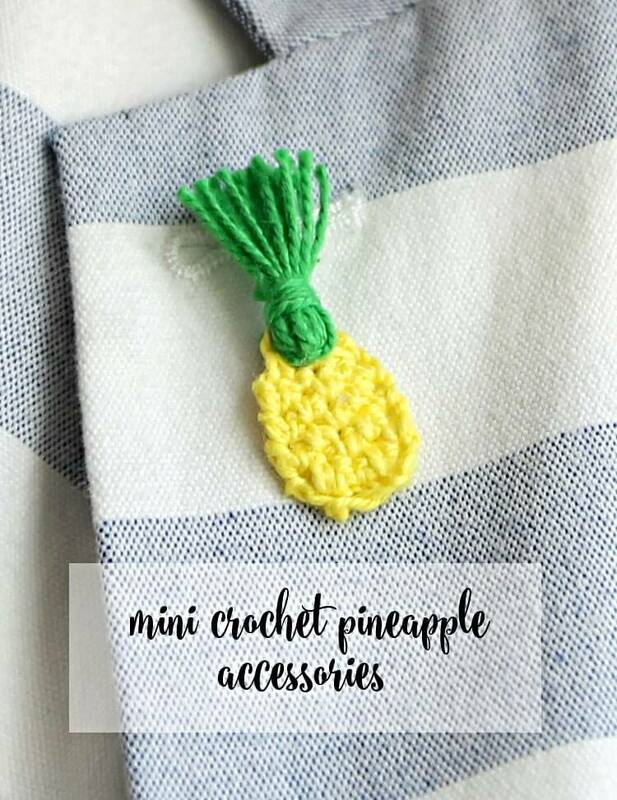 super cute idea – love the mini-ness of them – I think they would look great in a bowl too. Just wondering where you got the plastic eyelets to hang them from – never seen those before. Hi Tina! 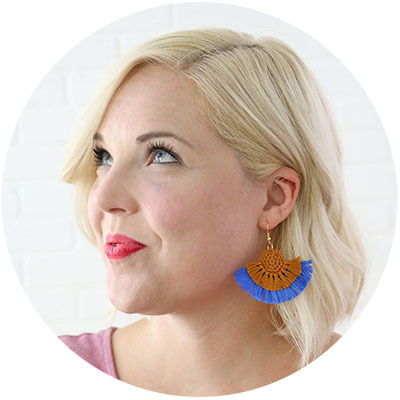 I got the eyelets from Floracraft, but I found a few places you can get them online including JoAnn, and sometimes on Amazon although they are out of stock right now (). I’m dying these are so cute! It makes me want to totally change my seashell summer decor…might have to do this next year for sure.